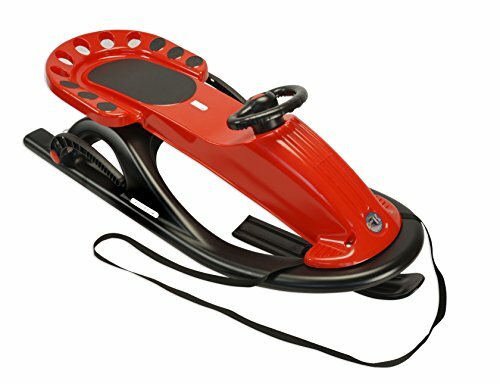 KWH Snow Future Snow Sleds are the ultimate alternative to old-school wooden sleighs and flimsy new-age toboggans. These sturdy sleds flaunt a durable plastic frame and stainless-steel runners for a safe yet speedy trip. Its sleek, lightweight design supports up to 250 pounds. The comfortable seat and recessed hand holds keep children in a safe, secure position while riding; a pull-along rope makes it easy to bring back up the hill. Unlike others on the market, KWH’s sled can take on small snow banks and ram hard drifts without showing any signs of damage. KWH products enjoy the same European-engineered qualities utilized by Germany’s Winter Olympic Team. Gift the joy of unlimited outdoor fun--Give KWH! ONLY THE BEST: KWH's sleek, modern designs come complete with a steering wheel and handbrake, sure to out-maneuver the competition. STURDY AND SAFE: an internal stainless steel runner holds a maximum weight capacity of 250-pounds. LET'S GO: use the pull rope to cart cargo then tow the sled to your next big race. HIGH-QUALITY, UV-PROTECTED PLASTIC: this trusty toy's rich colors won't fade even after extended light exposure. MADE IN GERMANY: KWH products enjoy the same European-engineered qualities utilized by Germany's Winter Olympic Team.